On Wednesday 19 November, a demonstration calling for the independence of West Papua was violently interrupted by Kamu police and military personnel. One demonstrator was shot with a rubber bullet, resulting in a serious injury that required hospitalisation. An investigation is underway to find the perpetrator of the shot but their identity is still unknown. Jayapura — On Wednesday 19 November West Papua National Committee (KNPB) member Ansalmus Pigay suffered a gunshot wound to his right leg after security forces broke up a KNPB demonstration calling for the separation of Papua from the Unitary State of the Republic of Indonesia (NKRI) in Moenamani, the capital of Dogiyai sub-district in the Papuan central highlands. In addition to injuring one person, police also arrested 11 KNPB members. 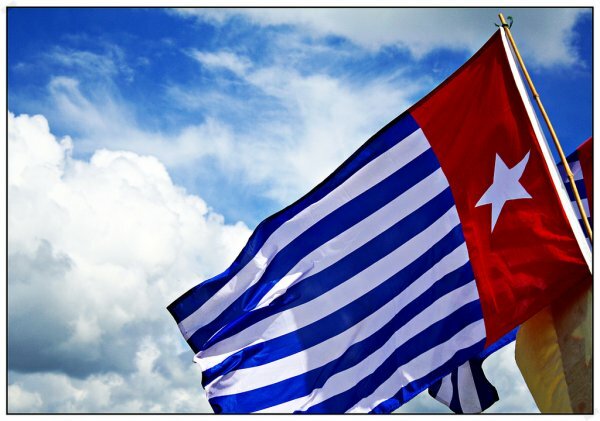 Papua regional police public relations chief Senior Commissioner Pudjo told the Antara news agency in Jayapura on Thursday that based on reports received the incident began with a demonstration by around 300 KNPB members in Moanemani. Security personnel from the Kamu sectoral police (Polsek) assisted by members of the Kamu sub-district military command (Koramil), the 753 infantry battalion (Yon 753), mobile police (Brimob) and the Air Force’s Special Forces (Paskhas TNI-AU) had already tried to persuade the protesters to disband. Pudjo said however that appeal was not heeded and after the sound of gunshots were heard security personnel fired warning shots. Pigay was hit by a rubber bullet and is currently being treated at the Enarotali public hospital. Pudjo said that the 11 KNPB members who were arrested were Elias Anauw, Marthen Mote, Agus Waine, David Pigai, Marthen Pigome, Paul Marthen Edoway, Alpos Edoway, Stepanus Goo, Ferdinan Pekey, Wiliam Pigai and Thomas Waine. In addition to the arrests, police also seized five KNPB flags and other material evidence. When asked about the identity of the shooter, Pudjo said that they have not yet been able to ascertain who the perpetrator is. “The head of the Professionalism and Security Affairs Division, Senior Commissioner Bambang will lead the investigation in Dogiyai in order to confirm who fired the shots”, said Pudjo.